An extremely popular style of rattan garden furniture is the rattan cube set of furniture, rattan cube sets are stylish and modern in design but have a unique feature which aids in their storage and the amount of space taken up within your garden. Rattan cube furniture has an extremely contemporary cube shape design with clean lines and a minimalist look. One of the main features of the cube design is the ability to fold down the back of the cube dining chairs until flush with the seat, this allows the cube chairs to be pushed under the matching dining table to aid storage when not in use and it also reduces the footprint and space taken up by the rattan set in your outdoor space. The design of the cube chairs also allows the storage of extra ottoman stools to be stored underneath, this allows you to have extra seating available for guests and these ottomans can even be stored underneath the seats when the cube set is in use. These types of rattan furniture design are one of the easiest to keep clean and store away in bad weather. Storing rattan cube furniture is a very simple and straightforward task, simply place any ottomans or stools under the dining cube chairs, flip the backs down on the chairs so that they remain flush with the cube cushion and position the cube chairs underneath the dining table to ensure they are flush on all sides, you can then place your waterproof cover over the top of the set and secure the covers fastenings securely around the base of the cube set. 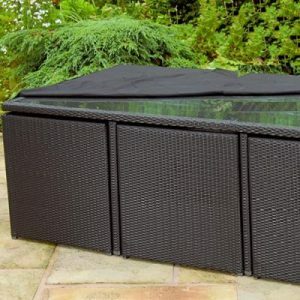 We recommend placing a piece of soft cloth on the corners of the table to prevent wear and tear on the inside of your waterproof rattan furniture cover, especially in locations with high winds. 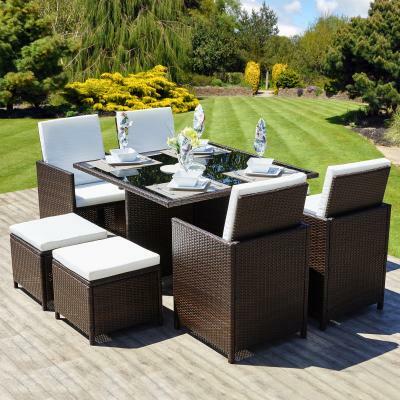 Your rattan cube set should now be safely ready to be left outside in the winter weather, allowing minimal cleaning in the spring in time for the new season.